Teaching English in a Foreign Land: Mayhem in Mexico D.F. Travelling the world as a TEFL teacher was full of surprises. Here's a short story of my first day in Mexico City's capital; Mexico D.F. I had a fantastic time while I was in Mexico trying to find a job teaching English. I never found work, mainly because they wanted long term commitment and I had no experience, but it's not all about the teaching. This is the first in a new series of short stories about my two months in Mexico. so much crime connected to these innocent taxis. When Dave suggested getting a green and white Beatle taxi in Mexico D.F, I knew he was mental. “But an American couple warned me against the drivers,” I said. “They got robbed.” Dave, an Irish lad in his late twenties with short black hair, gazed at me through a half full tequila glass. The bar was empty apart from a young group of Mexican lads in the corner sinking back Coronas. Trashy pop music blasted out. “Yeah, true,” he said. “But who cares? We haven’t got anything left to rob. We need to get back to the hostel to get some more money. This is our first night in Mexico and I’m not going to bed until we find some night life.” He downed the tequila, slammed the glass on the table, stood up, and marched out. I’d only met Dave twenty-four hours before. We were travelling virgins; first day on a round the world trip. We’d got chatting in the hostel’s van on the way from the airport and promised to see Mexico D.F. in style. So far we’d only found quiet bars and had spent all our pesetas. It was only 11pm. I’d promised myself I wouldn’t get in one of the Beatle style taxis. I’d read all about travellers who had been mugged and left in the middle of nowhere by the Mexican cab drivers. However, the tequila had weakened my inhibitions and Dave’s enthusiasm was catching. I never thought we’d end up where we did. I felt apprehensive about getting in the taxi. 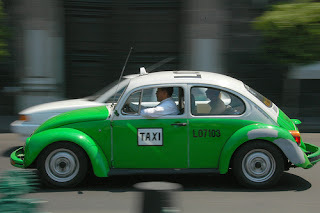 Even though we showed the driver we only had enough for the trip back to the Zocalo, I imagined he could get a full month’s wage selling us off to cowboys in the wild Mexican West. “Don’t worry mate,” Dave said. He must have sensed I was anxious. “We’ll get back in no time.” I wound down the window and a gust of petrol fumes from the bus in front made me cough. We whizzed alongside other taxis and the driver tooted at his colleagues. just round the corner from where I stayed. “There, nothing to worry about,” Dave said as we paced over the deserted Zocalo. In the afternoon it had been rammed with Inca dancers, local hair braiders, hotdog sellers, and tourists wandering round taking photos of one of the largest squares in Mexico. We arrived in tact, paid up, and darted into the hostel. 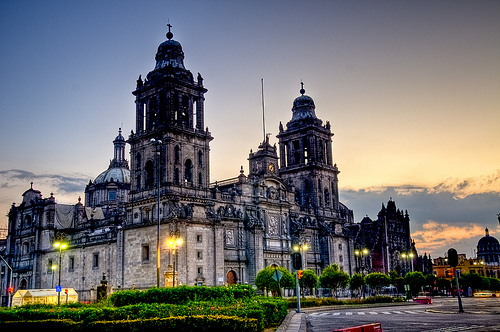 After we’d grabbed some money and asked the German receptionist where the nightlife was, we headed off over the Zocalo. I felt naive next to Dave. He was unfazed by the darkness and sombre plaza and paced around the empty back streets as if it was his home town. He heard some faint music in the distance and ran in front. “Crikey man! It’s a saloon bar,” he said. His eyes lit up. We were outside a seedy joint with a large wooden door. We peered through the frosted windows. “You sure about this?” I said. “What’s the worst that can happen?” We wandered in. Inside was dark, dingy, and smoky. Tough Mexican men, all over forty, turned their heads as the door slammed shut. I was surprised the slow salsa music didn’t stop. We grabbed a table in the far corner; away from the stage where locals were dancing, and a tall slim man served us. Men glanced over. As we sipped the ice cold beers I noticed the clientele were a tad odd. The women, also in their forties, were unattractive and wore frilly dresses with low cut tops. They flirted with the drunk, scruffy men. The air smelt sordid. “Is this a bar or brothel?” Dave said. “I was just thinking that, not the sort of action we were looking for eh?” Dave nodded slightly and stared towards the stage. Couples formed and left hand in hand. I thought we were in a decent hiding place, but an older woman pounced. “Hola, you speak English?” she said, startling Dave. “Si,” he said, sitting up. “Oh I love the English men. What you do here?” She sat down and revealed her cleavage. A Mexican lady of the night was chatting up Dave and he was enjoying it. After a while, a couple of angry men began staring at Dave and his new acquaintance. One gave the impression he was about to come over and throw Dave, or the woman, straight through the frosted window. She must have cottoned on because she excused herself, but we’d already done the damage. “Mate let’s get the cuenta, I think we’ve overstayed our welcome,” I said. “Why?” Dave smiled and nodded at the woman. “Don’t look, but there’re a couple of angry cowboys over there. I think we’ve invaded their ranch.” Dave glanced over, dropped his smile, and then ordered the bill. “You go?” asked the woman, startling us as we stood up. “Yeah, sorry we have to catch a bus tomorrow,” Dave said. “Oh that’s a pity,” she said, touching Dave’s arm. “Maybe another time.” He pulled back. As we paced out, I felt the eyes of the cowboys glaring. They talked louder and called out, but we looked ahead. “Jesus! What was that place?” Dave said. He looked uneasy as we jogged across the desolate square. The next day Dave shot off to Tequila in the north. Rumour has it there were more saloon bars up there. I never saw him again.